The MSTW Scoreboards metabox in the right hand column of the Edit Game screen is shown below. To assign the game to a new scoreboard (and create the scoreboard), simply enter the scoreboard name you want to use into the text box and click the Add button. 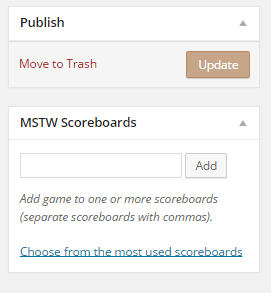 To assign the game to an existing scoreboard, enter it and it will autofill with a list to choose from, or use the “Choose from the most used scoreboards” link.